the world's first gourmet ice cream sandwich shop right in the heart of denver! have one to satisfy that sweet tooth, select a dozen to take your next event, enjoy a flight of four in house, or place an order online to pick up. headed to a party or having one yourself? carry out one, four, or two dozen! we have plenty of sandwiches on-hand in 10-12 flavor combinations at the shop. looking for the right size dessert to satisfy your sweet tooth? stop in and grab a sandwich and hot chocolate to enjoy in house or on the go. place an order online to pick up (at least 24 hours recommended). we'll have your order boxed and waiting. 1) map with google, it knows where to go. 2) when you arrive, either access through the alley running between 30th and 31st just east of blake or walk right through the backyard on blake to the back corner (see diagram to the right). the neighborhood around us is growing rapidly. with that, construction and increased density has made driving and parking challenging. 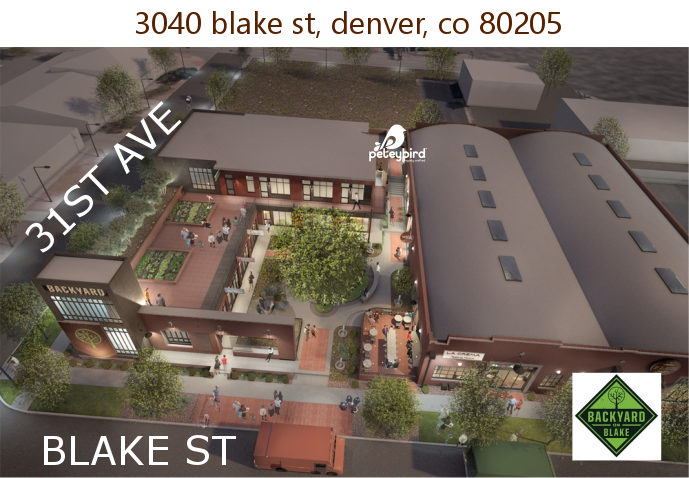 fortunately, the backyard on blake (the community of shops that includes peteybird) has made three free parking areas available around peteybird. see the map to the right. please be sure to follow posted signs. can't find parking in our lots? street parking around us is free. please be sure to follow posted signs.